After starting this at the beginning of November and abandoning it to holiday knitting, I picked it back up last week and finished. Scatter is an Icelandic fair isle sweater, featuring a nice bleeding color pattern. It was easy to follow, minus all the errors for the sleeve charts, but because its “scattered” color work, I don’t think you can tell that the stitch counts for the smallest size did not match up with the sleeve charts. I love the over-sized fit (the smallest size has a chest measurement in the 40-inches) and the super bulky Alafoss Lopi yarn I used to knit this (in the black sheep heather and lite indigo colorways), but the sleeves are too long by about 2-3 inches…again. So like my Stasis, I’m going to have to cut into the knitting and re-knit the ribbing on the sleeves. Normally I like long sleeves, but these go well past the ends of my hands, so it won’t work to wear this anywhere but bumming around the house, which is so not the point. Stay tuned for modifications and hopefully a better final fit. 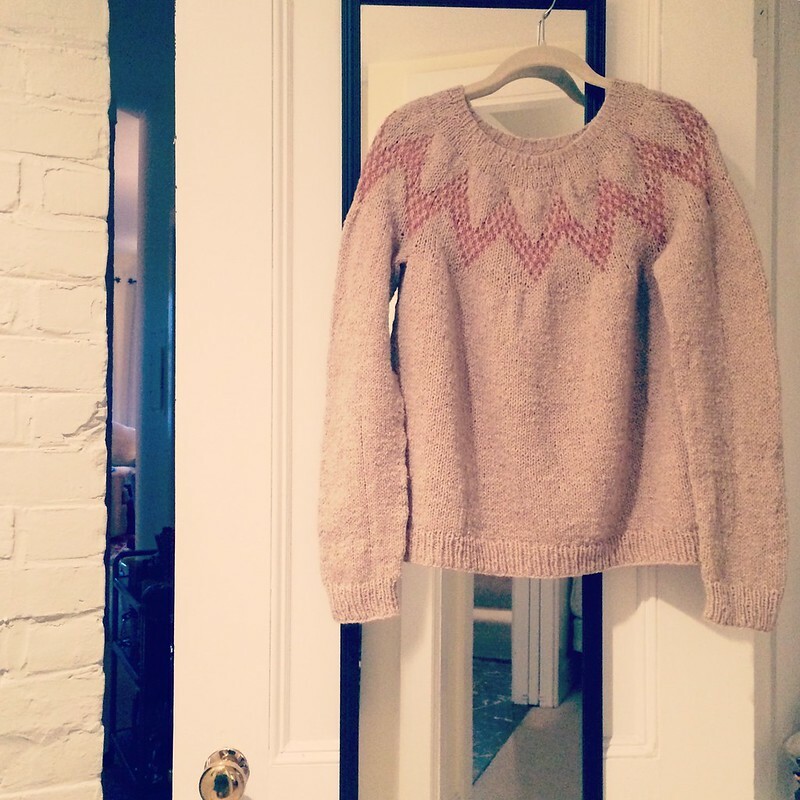 What Icelandic sweaters do you recommend I knit next? 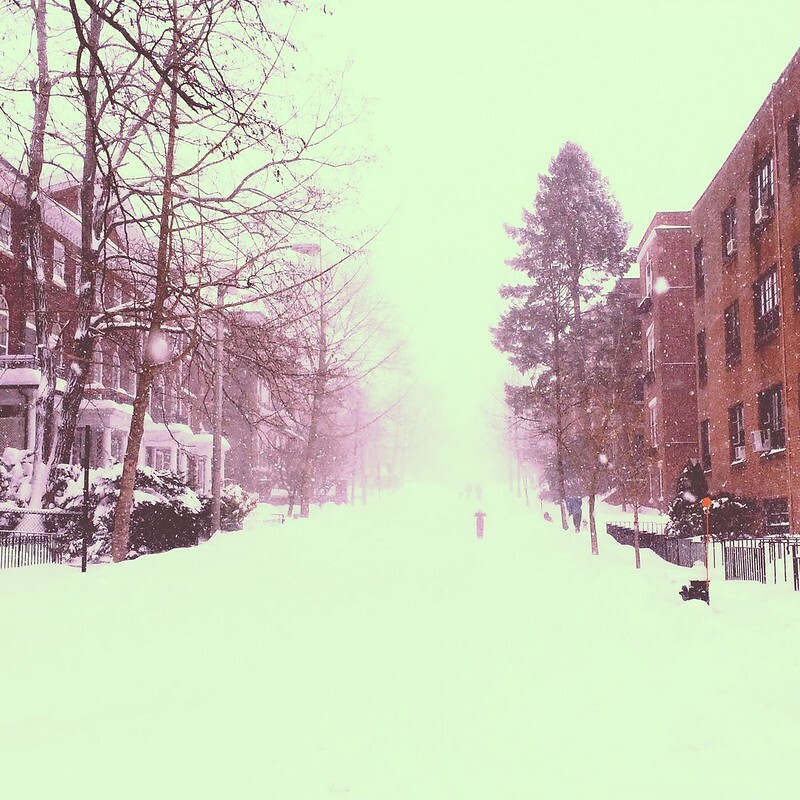 There’s nothing better than a blizzard bringing a major city to a halt. I love how quiet the city gets; my normally busy block is filled with prancing pups in the snow, people on cross country skis skating down Beacon Street, and kids on sleds on major roadways. 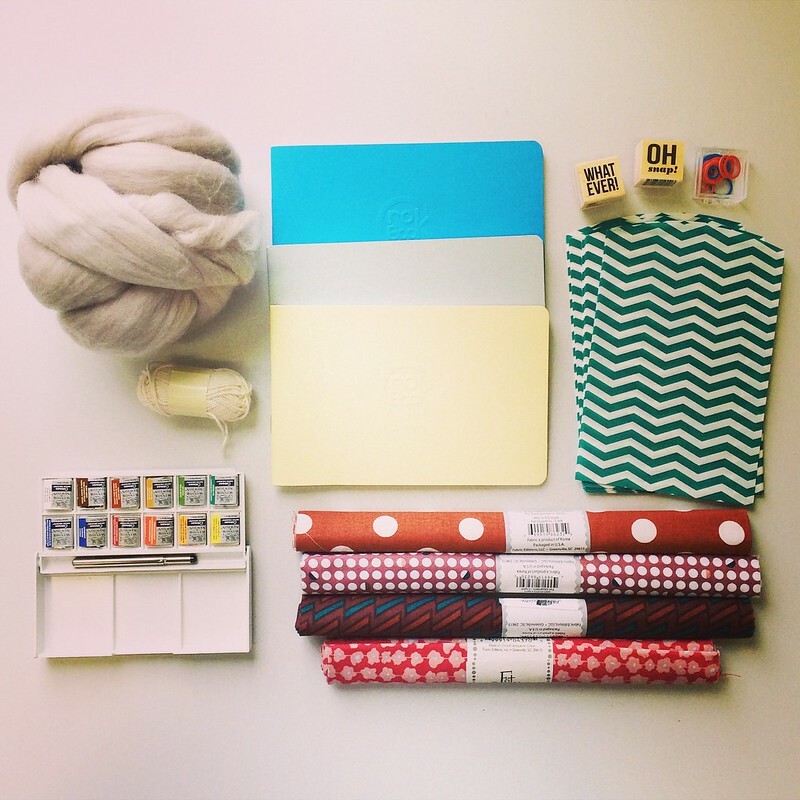 Plus, when school closes (since I’m a librarian at one), it affords me the opportunity to nurture my hobbies. 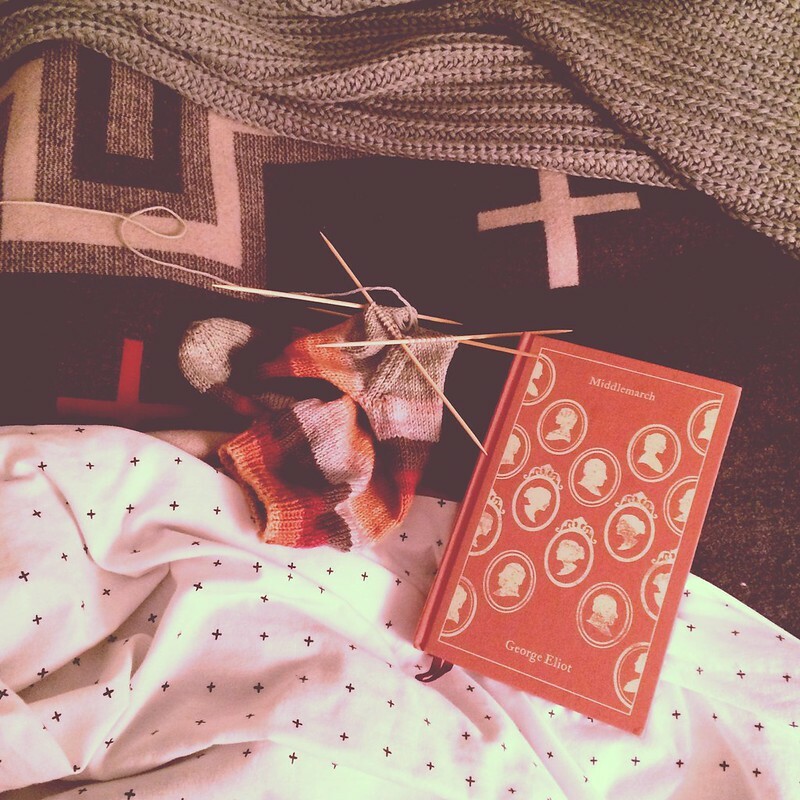 Days are spent knitting, reading, baking, and of course, shoveling, too. It wasn’t the most monumental storm I’ve seen in my 15 years here in this city, but it was a good one nonetheless. Thanks Juno, you’ve been fun. If you want to see more snaps of my winters here, take a look here. I’m not big on Valentine’s Day for the romantic aspect. I could care less about roses and candlelight dinners and expectations. I’m more throw me a mini box of chocolates like this favorite and make all the cute Valentine’s things. It’s really about the making, isn’t it? First up, of course, is a hearts hat for February. I knit this one up using two skeins of Malabrigo Merino Worsted in blue surf for the main color and bergamota for the hearts. 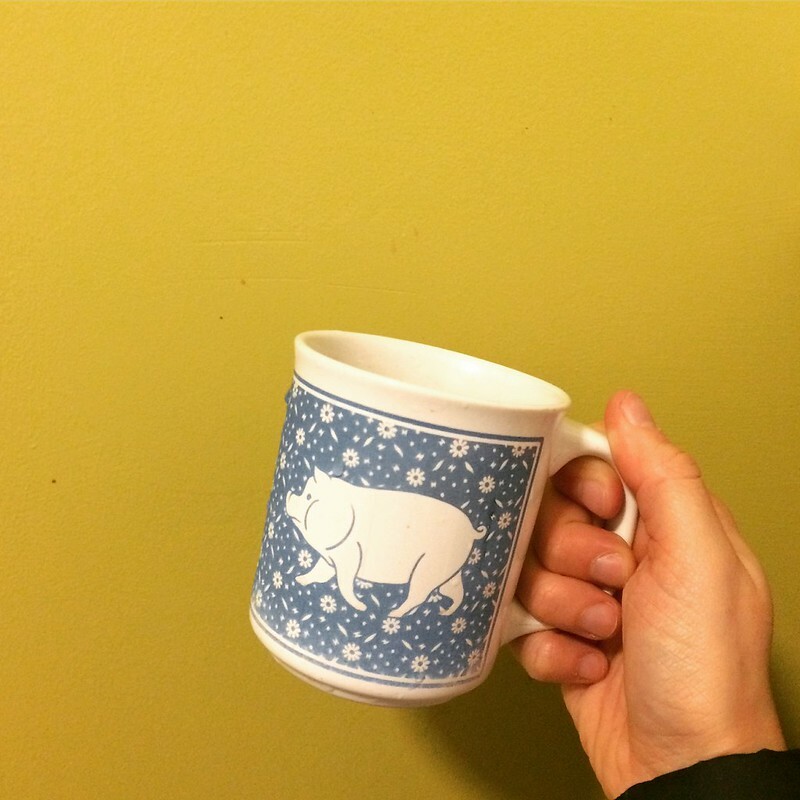 It came out just as I hoped–slightly slouchy, incredibly bright. 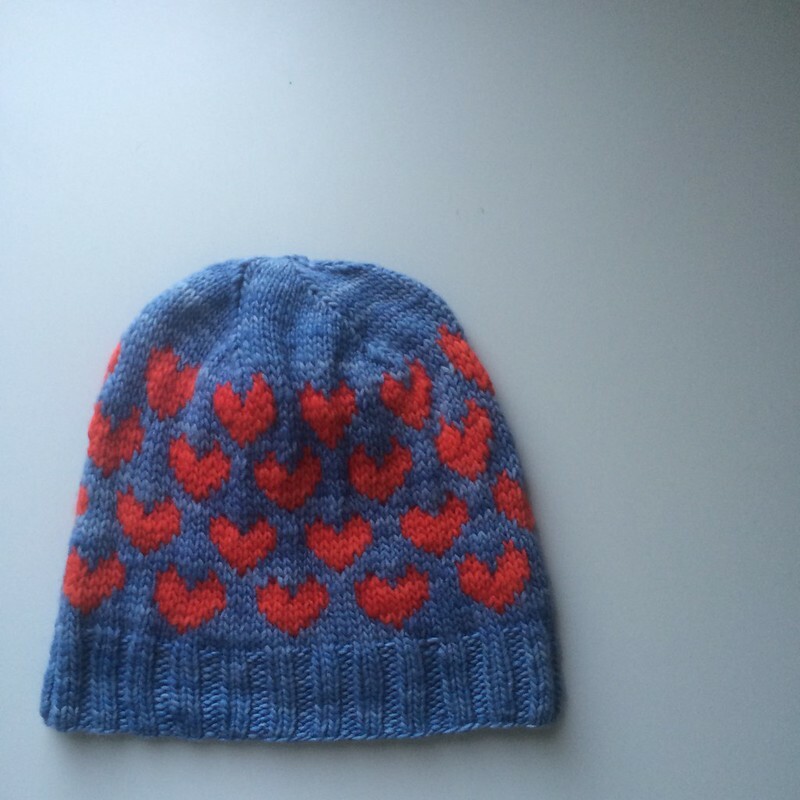 I did modify the pattern a bit (From Norway With Love) to accommodate a short heat by putting one less row of hearts in the color work section. I wore Willard last week and got loads of compliments. The fit is perfect. I like my sweaters to usually have about +2 inches of ease, and this hits the target mark. I seem to only get the best fit when I’m knitting a top down raglan sweater. Bottom up ones are often too long in the sleeves (despite following exact directions and gauge) and the yoke feels tight and uncomfortable over the top of my arms. What’s more, the armpits seem to hang low, not nice and snug as evidenced by Willard. Does anyone have any tips for getting a better fit for bottom up sweaters? Most of the ones I want to knit are bottom up, but I’m hesitant because I’m never happy with the fit. 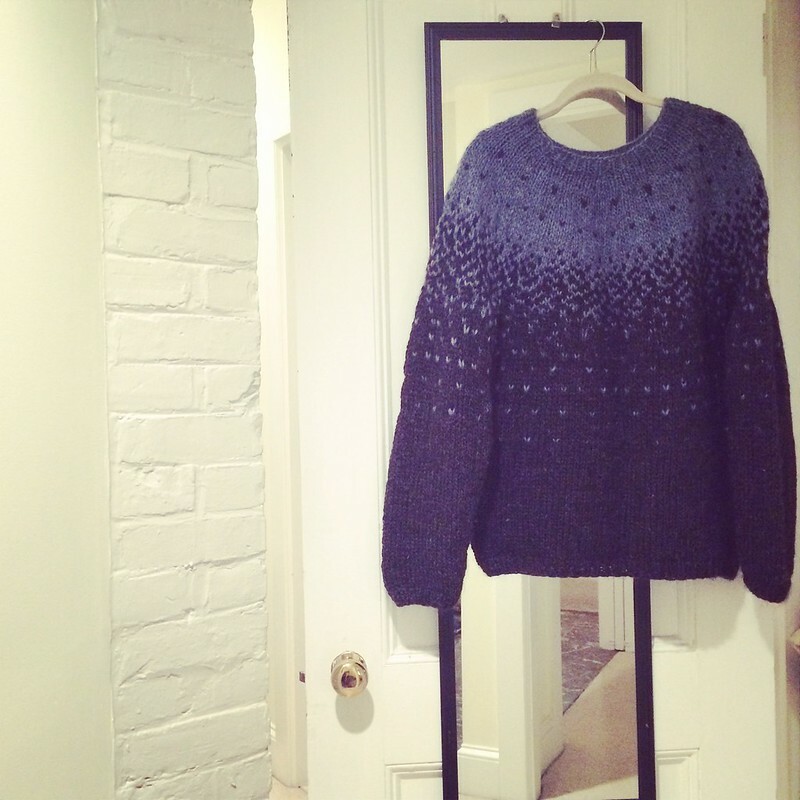 More on my Willard pullover here. I always have a whole bunch of books on my bedside table. I’m currently reading Stephen King’s The Stand and figured I would never finish it in a timely manner unless I was exclusive with its pages. And so, these continue to sit. They are all books I’ve had time with before–but I love, love, love re-reads. You get so much out of them. Desert Blooms, a lovely little guide book Sean bought for me last summer on our camping trip to Utah, is always with me. I think I have it wherever I go. 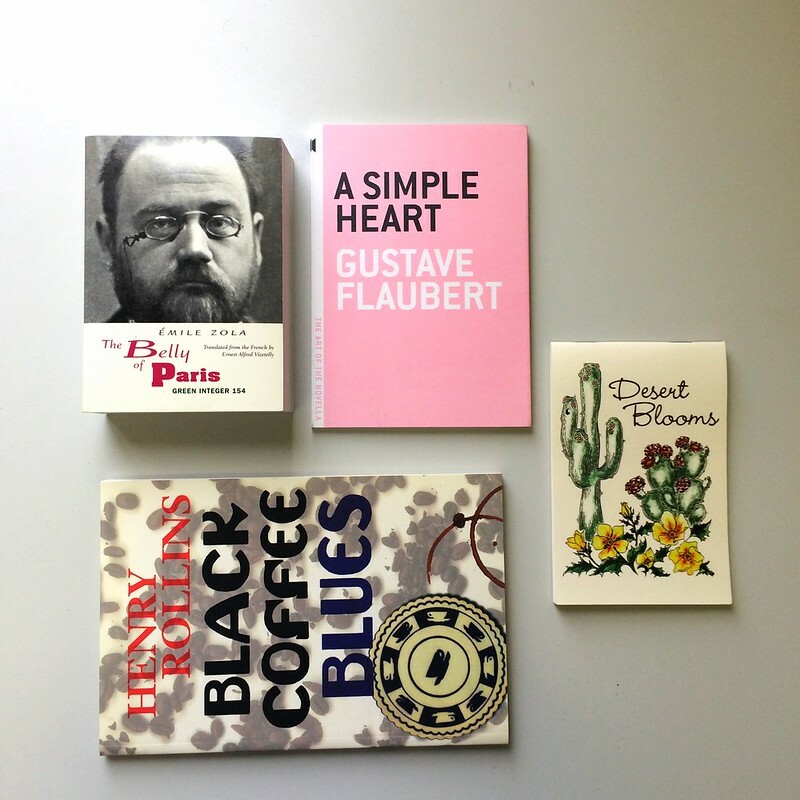 What books are kicking around on your bedside? 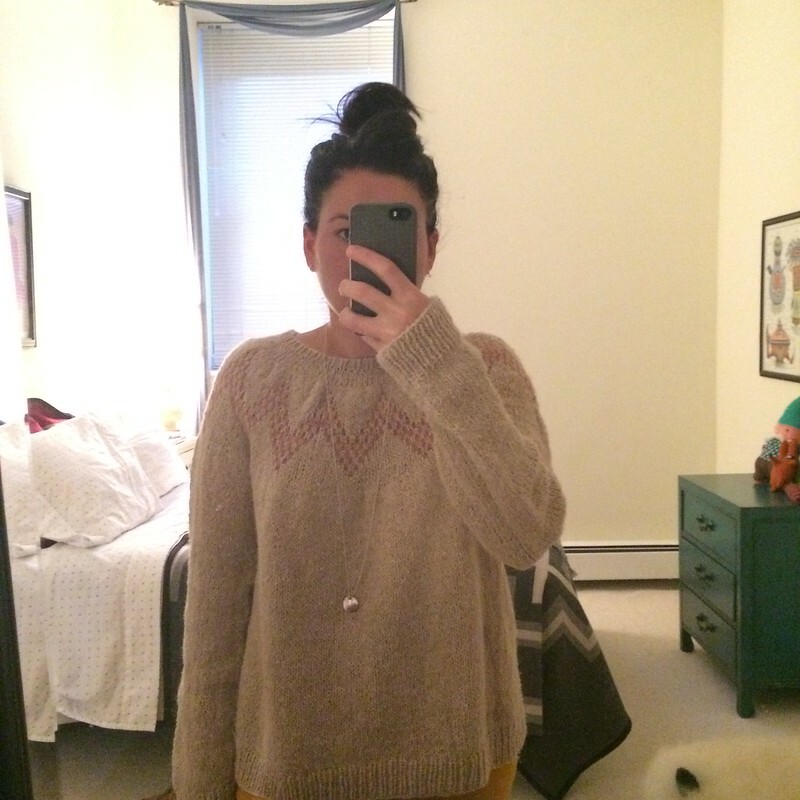 I finally finished my Willard pullover by Hannah Fettig. It shouldn’t have taken since the end of November because it was a simple top down with a bit of color work at the yoke. Alas, holiday knitting got in the way. This sweater is beautiful finished. It is everything I hoped it would be when I first stumbled on the pattern and wanted to knit it. I didn’t make any modifications and knit the 36″ size because I hate my sweaters to be skin tight–I like 2-4 inches of ease on most of my garments. Knit up using Quince and Co.’s Owl yarn in the tyto color way for the main color and canyon for the contrast, I’m so pleased with the color choice even though there was much hemming and hawing because of limited availability of owl at the time. You should definitely knit the Willard. Snaps when I finally wear it. Read my travels with knitting the Willard here. It’s been a cold, dark world for the cheese lover in me. 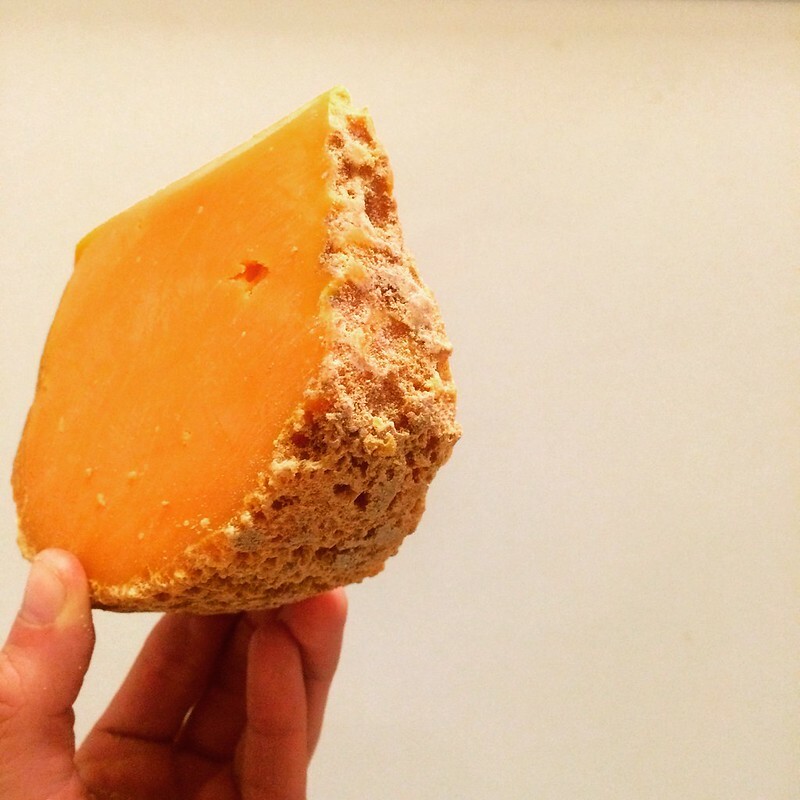 For more than a year, my favorite cheese–an institution in and of itself in France–has been banned from US shores for one ridiculous reason: the FDA feared dust mites discovered on that crusty rind often likened to the surface of some uninhabitable planet in the outer reaches of our solar system. And now it’s back. The other night, I procured a slice of this beautiful beautiful fromage for the first time in what feels like a dark, cold stretch of my existence. Any other cheese lovers out there? Since I finished my Willard pullover on Sunday, I’m thinking about the few scattered projects I have around that need finishing. A sweater; a wide wrap. More importantly, when checking in on what was started and never finished, I’ve been better. 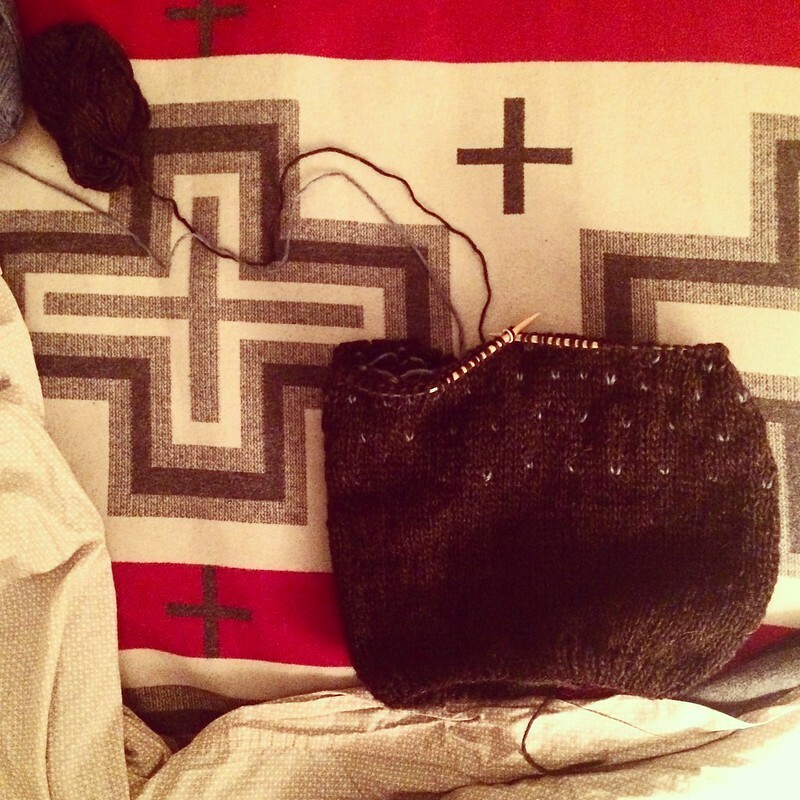 In the last couple of years, there’s been less and less on the needles at one time. I’m pleased as punch with this progress in not starting new things as soon as I see them and know I want to knit the pattern. 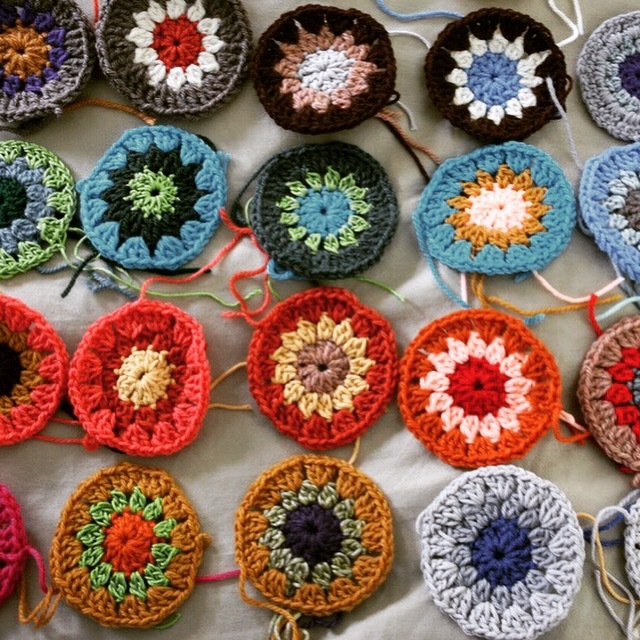 But, in my inventories last week, I discovered piles and piles of these crocheted circles, which were meant to be for a blanket just like this. Should I get back to it at some point? Most people I’ve already asked say yes. It seems so far away, so long ago, that I started that project (I actually think it was 2008 or 2009–don’t judge me!). Still, it can be so great. An afghan to have for life. And I’m almost halfway there, right? What do you think? Get back to it or abandon? Is any project too dead in the water? Here is the bottom of the body of my Scatter pullover, knit in Istex Alafoss Lopi, which is definitely really scratchy but heavy and lovely in my opinion. I’m using the black heather and indigo colorways. I’ve knit one sleeve, too. This weekend I will finish the second sleeve, join the sleeves to the body, and hopefully finish the yoke too. Ambitious, I know, but Willard is nearly complete, and I’d like to check this one off, too. It’s been too long since I’ve worked on it.